The concept of the endocannabinoid system was outlined a mere 14 years ago, and look how far we have come! Today “phytocannabinoid therapeutics” is the newest, fastest growing field in medical research. As this medical cannabis evidence-based tsunami approaches, its main therapeutic action appears to restoring homeostasis to multiple body systems. The action by which phytocannabinoids heal is by reestablishing the proper immune set points within CB 1/2 receptors in both brain and body. 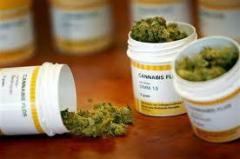 Research supports medical cannabis as important a medical discovery as insulin or penicillin were in their day. Perhaps the root of many human illnesses is an anandamide deficiency, which, when corrected and rebalanced by THC intake, produces homeostasis. 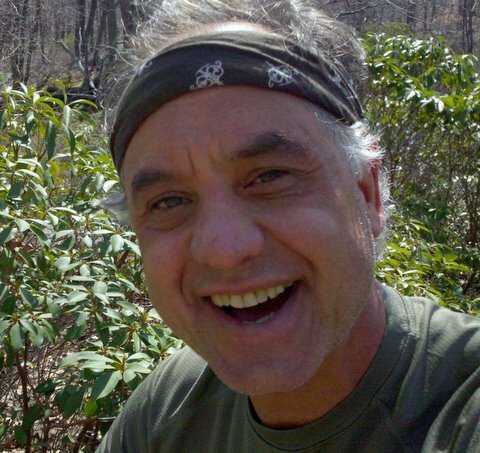 Whatever anandamide does in the body, phytocannabinoids mimic. My prediction is that phytocannabinoids will ultimately be found to be an vital to human health. Phytocannabinoids mimic the same actions of Anandamide in the brain and body, which maintain homeostasis, maintaining wellness and disease prevention! THC is unique, in that it is only found in one plant on earth. 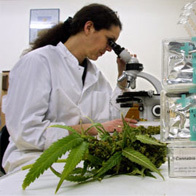 ​The female cannabis plant is a THC-resin factory. THC, which makes up the plant’s resin, has the important job of collecting pollen from the male plant for fertilization. No THC-laced resin, no seed production. Additionally, this resin tastes very bad to herbivores, which leave it alone, and it also offers superior UV protection to the plant at high altitudes. The cannabis plant has only two functions: to make THC and seeds. THC is the most abundant “phytocannabinoid” within the cannabis plant. All other THC-like substances in the plant are THC intermediate metabolites being assembled by the plant on their way to becoming THC. Once the plant is cut down and dies, the THC degrades into cannabindiol. Cannabinol (CBN) is the primary product of THC degradation, and there is usually little of it in a fresh plant. CBN content increases as THC degrades in storage, and with exposure to light and air, and it is only mildly psychoactive. Why would just this one plant, and the phytocannabinoids it produces control not one, but two dedicated molecular receptors for phytocannabinoids, with more predicted to still be discovered? Did evolution intend for them to be naturally consumed for proper body function? As any other plant-derived antioxidant? ​All healing, cancer fighting and aging in your body is controlled by the immune system. 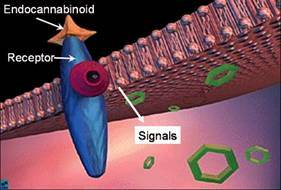 CB1 cannabigenic receptors are the majority of receptor type in the synaptic clef. THC-activated CB1 brain receptors directly link up and control the microglial cells in the brain; the microglia is the specialized white blood cells that make up the brain’s dedicated immune system. Cannabidiol is degraded THC. It activates CB2 receptors mostly in the body. In both cases, THC controls both immune systems (brain and body), in one form or another. It seems that CB1 brain receptors link up to CB2 body receptors, which in turn control many autoimmune diseases. The word used to describe this cannabis brain/body link up is Psychoneuroimmunology. 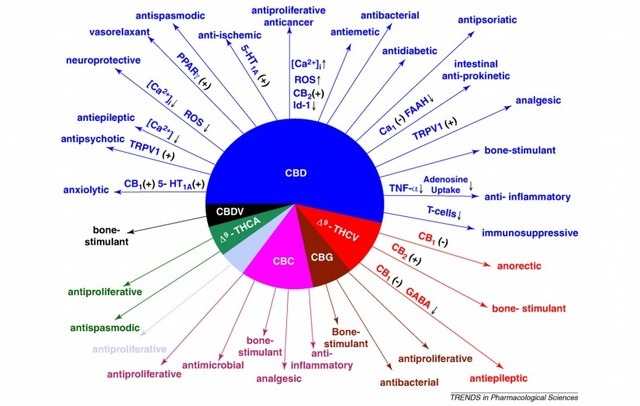 “Cannabinergic Psychoneuroimmunology” — cannabinoid-induced immune system healing. 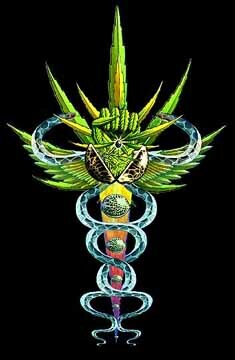 Cannabis consciousness repairs your immune system: never underestimate the power of a bong hit! “Moreover, synthetic cannabinoids (Delta 9 THC) and the endocannabinoid system play a role in inhibiting cancer cell proliferation and angiogenesis, reducing tumor growth and metastases and inducing apoptosis ( self destruction for cancer cells) in all three types of cancers reviewed here. IMPORTANT: This is a very intriguing observation. What is being implied here is that some people may be suffering from an anandamide deficiency! Just as a diabetic is insulin deficiencient and must supplement their body with insulin, in this case THC is the vital medicine needed to replace low levels of anandamide. These observations also raise the exciting possibility that enhancing cannabinoid tone (code for THC locking into the CB1 receptor) through cannabinoid based pharmacotherapies may attenuate these harmful processes to produce anti-cancer effects in humans. Bottom line: Smoking marijuana prevents cancer body-wide. Sites of action of cannabinoids in the enteric nervous system. CB2 receptors indicated with the marijuana leaf. Cannabiols via CB1 and possibly CB2 receptor activation, have been shown to exert apoptotic actions in several colorectal cancer cell lines. See the illustration at left for how THC/cannabidiol activates the CB1/2 receptors to shut down colon cancer by signaling cancer cells to self-destruct. 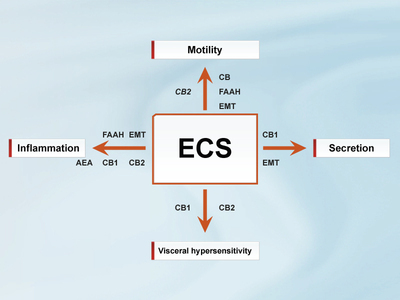 Schematic illustration of the functional roles of the endocannabinoid system (ECS) in the gastrointestinal tract. The ECS regulates four major functional elements in the gut: motility, secretion, inflammation, and sensation in health and disease. 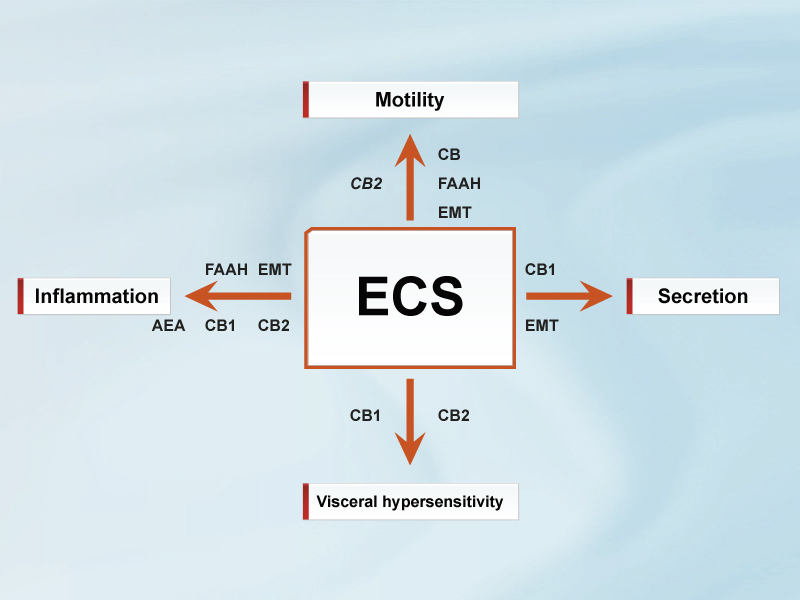 Major components of the ECS that have been defined in each of these functional roles are shown: CB1 and CB2 receptors, anandamide (AEA), fatty acid amide hydrolase (FAAH), and the endocannabinoid membrane transporter (EMT). For motility, the CB2 receptors only appear to be active under pathophysiological conditions and are shown italicized. ​Findings: Stemming from the centuries-old and well known effects of Cannabis on intestinal motility and secretion, research on the role of the endocannabinoid system in gut function and dysfunction has received ever increasing attention since the discovery of the cannabinoid receptors and their endogenous ligands, the endocannabinoids. 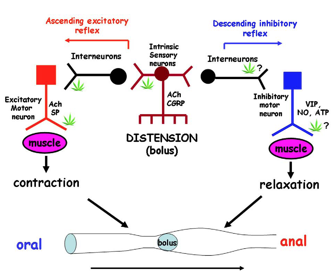 In this article, some of the most recent developments in this field are discussed, with particular emphasis on new data, most of which are published in Neurogastroenterology & Motility, on the potential tonic endocannabinoid control of intestinal motility, the function of cannabinoid type-1 (CB1) receptors in gastric function, visceral pain, inflammation and sepsis, the emerging role of cannabinoid type-2 (CB2) receptors in the gut, and the pharmacology of endocannabinoid-related molecules and plant cannabinoids not necessarily acting via cannabinoid CB1 and CB2 receptors. These novel data highlight the multi-faceted aspects of endocannabinoid function in the GI tract, support the feasibility of the future therapeutic exploitation of this signaling system for the treatment of GI disorders, and leave space for some intriguing new hypotheses on the role of endocannabinoids in the gut. ​Findings: CB2 receptors maintain bone remodeling balance, thus protecting the skeleton against age-related bone loss. 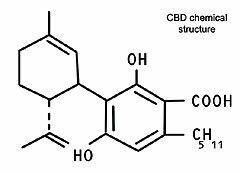 The active component of marijuana, Delta(9)-tetrahydrocannabinol, activates the CB1 and CB2 cannabinoid receptors, thus mimicking the action of endogenous cannabinoids. 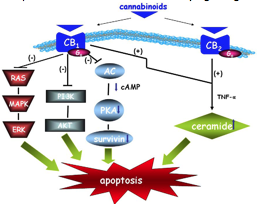 CB1 is predominantly neuronal and mediates the cannabinoid psychotropic effects. CB2 is predominantly expressed in peripheral tissues, mainly in pathological conditions. So far the main endocannabinoids, anandamide and 2-arachidonoylglycerol, have been found in bone at ‘brain’ levels. The CB1 receptor is present mainly in skeletal sympathetic nerve terminals, thus regulating the adrenergic tonic restrain of bone formation. CB2 is expressed in osteoblasts and osteoclasts, stimulates bone formation, and inhibits bone resorption. Because low bone mass is the only spontaneous phenotype so far reported in CB2 mutant mice, it appears that the main physiologic involvement of CB2 is associated with maintaining bone remodeling at balance, thus protecting the skeleton against age-related bone loss. Indeed, in humans, polymorphisms in CNR2, the gene encoding CB2, are strongly associated with postmenopausal osteoporosis. Preclinical studies have shown that a synthetic CB2-specific agonist rescues ovariectomy-induced bone loss. Taken together, the reports on cannabinoid receptors in mice and humans pave the way for the development of 1) diagnostic measures to identify osteoporosis-susceptible polymorphisms in CNR2, and 2) cannabinoid drugs to combat osteoporosis. ​​Findings: Traumatic brain injury (TBI) represents the leading cause of death in young individuals. FINDING: THC activation of the CB1 receptor is the same as the action of anaidemide on CB1 This article discusses how anandamide increases in the brain after injury, so THC may have the potential to become a front line emergency medicine in the future. This review is focused on the role the eCB system plays as a self-neuroprotective mechanism and its potential as a basis for the development of novel therapeutic modality for the treatment of CNS pathologies with special emphasis on TBI. Not only is CBD cardioprotective — it is also an anti-epileptic, sedative, anxiolytic, antipsychotic, antioxidant, neuroprotectant, anti-inflammatory, anti-diabetic, anti-emetic, and anti-tumorant. ​Findings: Cannabidiol (CBD) is a phytocannabinoid, with anti-apoptotic, (the process of programmed cell death) anti-inflammatory and antioxidant effects and has recently been shown to exert a tissue sparing effect during chronic myocardial ischaemia and reperfusion (I/R). However, it is not known whether CBD is cardioprotective in the acute phase of I/R injury and the present studies tested this hypothesis. EXPERIMENTAL APPROACH: Male Sprague-Dawley rats received either vehicle or CBD (10 or 50 microg kg(-1) i.v.) 10 min before 30 min coronary artery occlusion or CBD (50 microg kg(-1) i.v.) 10 min before reperfusion (2 h). The appearance of ventricular arrhythmias during the ischaemic and immediate post-reperfusion periods were recorded and the hearts excised for infarct size determination and assessment of mast cell degranulation. Arterial blood was withdrawn at the end of the reperfusion period to assess platelet aggregation in response to collagen. Remember to exercise your ganja rights! Every day is a Ganja day!